The Lutheran Reformation will soon be celebrating its 500th anniversary. Tonight PBS airs “MARTIN LUTHER: THE IDEA THAT CHANGED THE WORLD,” the story of the Protestant Reformation and the use of means at hand to change the world with its teachings. 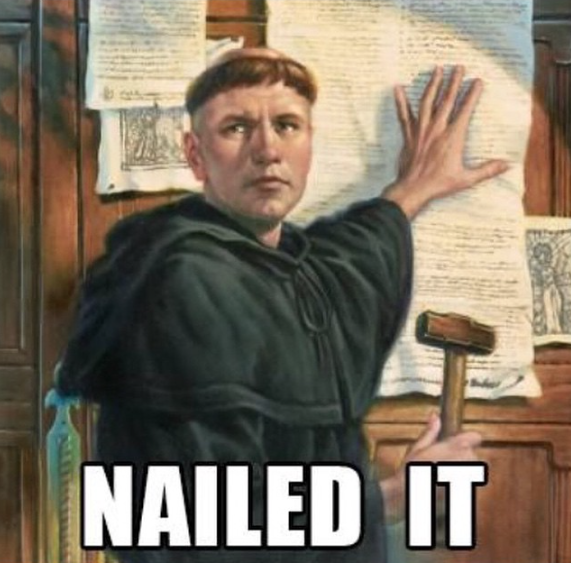 On October 31, 1517, Luther nailed his 95 theses to the church door at Wittenburg, Germany. These were complaints against the abuses of the Roman Catholic church. This paper would have carried little clout had it not been for the invention of the printing press. We might consider it the social media of the day. Without the printing press, Luther would’ve been just another dissatisfied monk, but because of it, his ideas spread like wildfire and sparked individualism in thinking for those who had been forced to buy their way to heaven with the sale of indulgences. The true Reformation had more to do with letting people know the truth of God’s Word – which had been corrupted by the Catholic Church of the time, to serve their own purposes. The Bible was then translated into the language of the people, making it accessible to the common man. For the first time, they could read it for themselves and see the truth of salvation without conditions. Martin Luther’s dramatic conversion and decision to enter the monastery was not looked upon well by his father. He had hopes of Martin entering a more lucrative lifestyle, but that wasn’t God’s plan for his life. As with most of us, we think we know what we’re supposed to do with our talents, but God knows better. He can take the weakest of our abilities and turn them into amazing uses for the advancement of His kingdom. So I guess you could say, Luther was in a way, the father of social media, but God was behind the man – teaching him, opening his eyes to the truth, giving him the tools necessary to make it happen. Luther never wanted his movement to carry his name. He struggled through his years in the monastery. He beat himself, consistently prayed and did good deeds and suffered because he never felt he could do enough to earn his salvation. In his studies of scripture, he finally realized that Jesus had already paid the price for his sins. That moment of realization must have been a relief for this man who could never do enough. The power of the Old Testament convicts us. It shows us that we can never live up to God’s expectations – that we need a Savior. The New Testament shows us that God is our Savior and He alone provides salvation for repentant hearts. We’re facing another time of reformation in our churches today. We have the amazing tools of the internet to help spread the wonderful news of God’s love. We could ignore their importance or make use of them. I believe that God has given us this great opportunity to draw people back to Him. Let’s use it! This entry was posted in Christian devotion, God's plans, Uncategorized and tagged Christianity, encouragement, Inspiration, internet, Luther, reformation, technology. Bookmark the permalink.